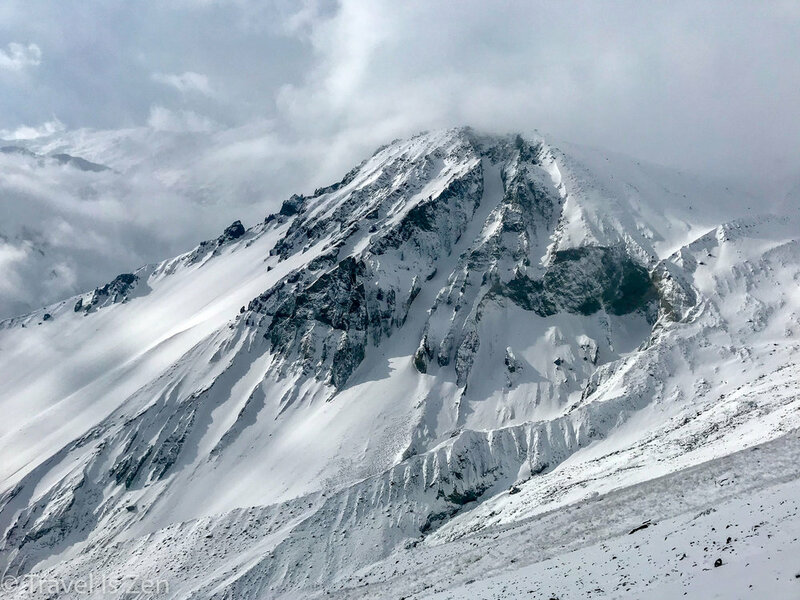 The trek to Tilicho Lake requires an early morning start to summit and return to camp before the notoriously tempestuous weather turns for the worse in the afternoon. We awoke at 5:00 a.m. to several inches of fresh powder. To go or not to go? That was the hot topic of discussion among the hikers gathered for a pre-dawn breakfast. We were the first to leave the inn at 6:00 a.m. and the trail was completely covered in snow. We were just beginning to doubt our decision when we came upon a flurry of footprints from a group that had left earlier from another lodge. We followed their tracks up the snowy, icy slope. The sun was trying to warm its way through the thick cloud cover, but it faced quite a battle. The clouds swirled fast and furiously at the top of Khangsar Kang peak off to our right. As we slowly and carefully climbed, the sun was clearly losing. At times, its rays were completely obscured by thick fog and agitated clouds, the whole mass of which was descending lower and lower onto the trail. We eventually overtook and passed the group of Nepalese students whose footsteps we had been following. A bit later, two Korean men and their Nepalese porter (Mukesh Rai) caught up with us and we hiked as a group. As our team of five strove for the plateau at the top of the hill, we were often in white-out conditions, unable to see much further than a few feet ahead or behind. 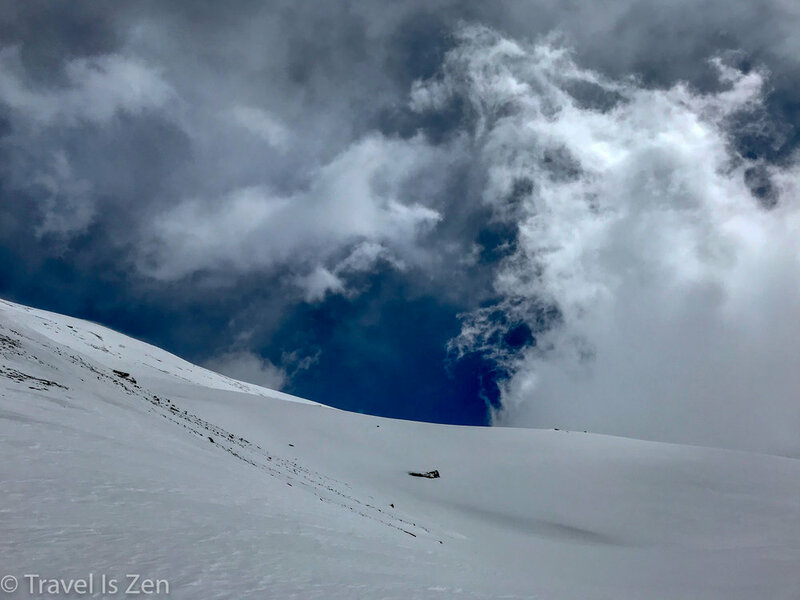 My mind kept recalling every mountaineering disaster story I had ever read; I over-imagined dramatic avalanche scenarios triggered by a single sneeze. Just as we would begin discussing whether or not to turn back, the sun would power through the grey and light up the landscape as if to encourage us forward. Onwards and upwards (brave? or foolish?). At the top of the hill, the snow was pristine virgin, obscuring whatever path may have lain below. We saw a vast plain with no discernible trail. 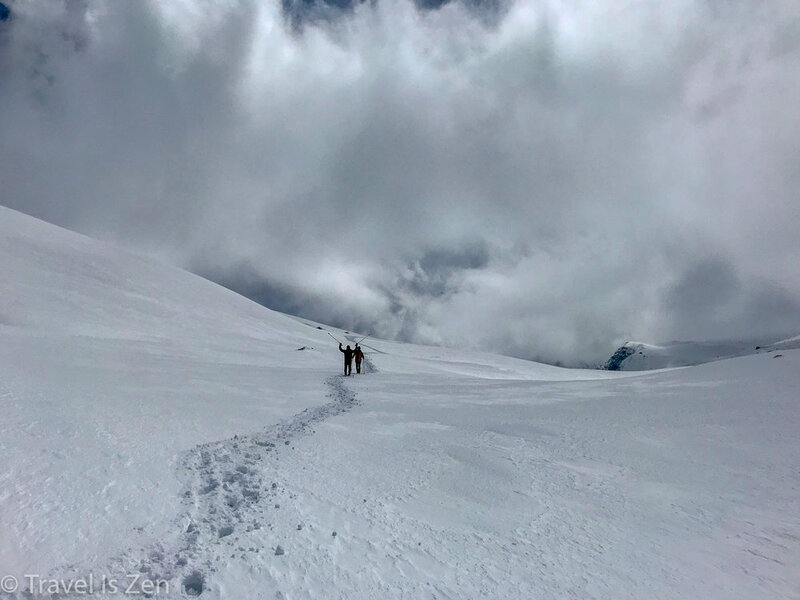 Mukesh was in the lead, tasked with trail blazing in the thigh-deep snow as we argued and debated the correct course, checking iPhone apps and paper maps. We bumbled around on this plateau for probably 45 minutes before it became apparent that we were not going to make it to the lake. The snow was simply too deep and the clouds had called in reinforcements. When we heard the low rumble of thunder off in the distance (AVALANCHE! ), we called it a day. I wrote "We stopped here" in the snow and then we all turned back, retracing our footprints. We had not realized the extent to which we had been trailblazing! As we headed back across the plateau, we encountered a couple dozen people who had been following our tracks helter skelter across the snow basin. Poor souls! We informed them that we did not make it to the lake but wished them luck. By this time, I was more worried about the brewing storm than the sense of defeat for not reaching the lake. The thunder and lightening in the distance hastened our pace down the switchbacks back to Tilicho Base Camp. It began to sleet and the path was icy as we reached the inn and I prayed for the safe return of all the people still on the trail (everyone returned safely). Later that evening, over hot beverages, we learned that nobody had made it to the lake. My words in the snow were written about 800 meters from the ridge that had separated us from the lake on the opposite side. Only two other people tried to go further than our turning point and neither could find a way through the snow basin. Under normal circumstances, I might have felt disappointed that we failed to accomplish our goal. We did not make it to the lake. But the reward today was not in the outcome; it was in the adventure. We witnessed an exhilarating show of nature's opposing forces caught up in a ferocious tug-of-war. The sun, wind, and clouds were oblivious to the tiny human bystanders scurrying about on a lonely hilltop. The energy of their performance was dramatic; it felt powerful and real. For some of us, the experience was even cathartic. It was worth the effort.